Xiaomi on the occasion of its fifth anniversary has unveiled a more affordable variant of the Redmi 2, the Redmi 2A. 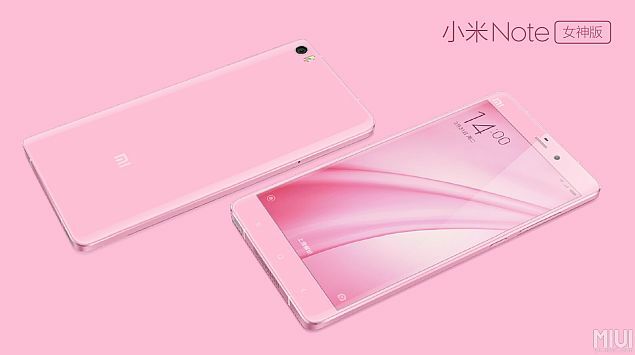 The Chinese company alongside also unveiled the Mi Note (Pink Edition). Xiaomi’s CEO Lei Jun at an event in China unveiled the two new products.The Xiaomi Redmi 2A has been launched at CNY 599 (approximately Rs. 6,000) and will be available at a special price of CNY 499 (approximately Rs. 5,000) on April 8 in China. The Xiaomi Mi Note (Pink Edition), on the other hand, has been priced at CNY 2,499 (approximately Rs. 25,000), which is slightly more than the original Mi Note that was launched at CNY 2,299 (roughly Rs. 23,000) for the 16GB model. 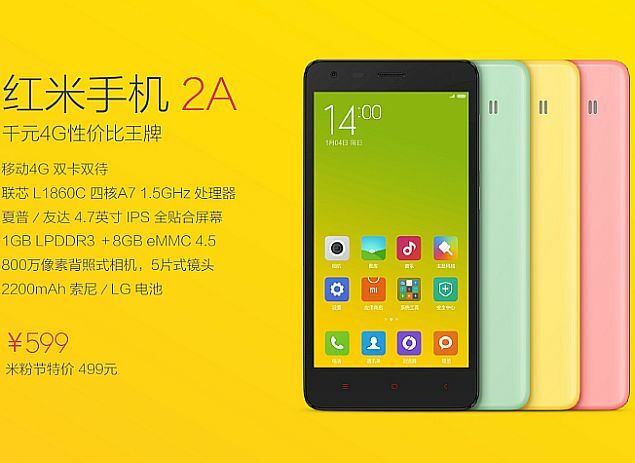 The new Redmi 2A is cosmetically identical to the original Xiaomi Redmi 2; though the former features a different CPU. The Redmi 2A is powered by a 1.4GHz quad-core Leadcore (L1860C) Cortex-A7 processor coupled with 1GB of RAM. The Xiaomi Redmi 2, on the other hand, is powered by a 64-bit 1.2GHz quad-core Qualcomm Snapdragon 410 Cortex-A53 processor coupled with 1GB of RAM. Another highlight of the smartphone is it supports 4G LTE, much like its sibling. Other specifications include 4.7-inch HD (720×1280 pixel) IPS display with a 312ppi; 8GB of inbuilt storage expandable via microSD card (up to 32GB); 8-megapixel rear camera with f/2.2 lens, 2-megapixel front-facing camera, and a 2200mAh battery with fast-charging. It supports TDD-LTE Bands 38, 39, 40, and 41. Other wireless connectivity options include Wi-Fi 802.11 b/g/n with Direct and wireless display functionality, alongside GPS/ A-GPS. 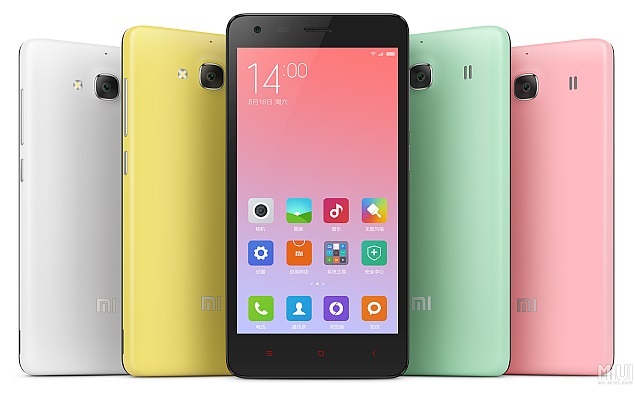 It retains the same dimensions as the Redmi 2 as well, at 134.00×67.20×9.40mm. Xiaomi claims that the new Mi Note (Pink Edition) has been “tailored edition for modern ladies.” The Chinese company is also offering a 5000mAh battery power bank along with the handset. For specifications, the dual-SIM and dual-standby Xiaomi Mi Note (Pink Edition) with Micro-SIM and Nano-SIM card support features a 5.7-inch full-HD (1080×1920 pixels) display. It also packs Corning Gorilla Glass 3 for protection. The handset sports a metal frame. It sports a 13-megapixel rear camera while there is a 4-megapixel front-camera also onboard with large 2-micron pixels. The phablet is powered by a quad-core Qualcomm Snapdragon 801 processor clocked at 2.5GHz alongside 3GB of RAM and Adreno 330 GPU. The Xiaomi Mi Note also supports 4G LTE connectivity and is backed by a 3000mAh battery with Quick Charge 2.0 technology.